Caption: What does God need a bad movie for? It seems to be all the rage right now to explain why one is an atheist. Before I read anyone else's story, I thought it might be a good idea to tell my own. Don't want to be accused of plagiary, now do I? Unfortunately, why I'm an atheist is rather difficult to explain. There are no inspiring stories of being rescued from a cult by deprogrammers, or some deep insight that just suddenly struck me one day while I was trying out some new mutant strain of peyote. It was all pretty much done by the time I was ten. I don't remember a lot from when I was that age. You might think that would mean that my parents were atheists, but that's not true. Neither were. My father was largely uninterested in religion, and my mother was turned into an agnostic thanks to the foolish nonsense the Catholic church of her day thought that all young women should naturally want to do. While we were growing up, they "experimented" with different religions, most based on Christianity. There was a Lutheran church for a while, and a Moravian one, I think, and then we went all Unitarian for a while. None of that seems to have made much of an impression on me. The truth is that after learning that there was no such thing as Santa Claus, the Easter Bunny, the Tooth Fairy, or all the things in Grimm's Fairy Tales, that all those Bible stories just sounded like more magical stories people told each other. I'd read enough about science by then to learn how scientists thought the universe began, and that it was composed of matter, which behaved according to well-understood rules. That made a lot more sense to me. You might wonder at this point how a ten year old boy, who should have just barely been at the stage of mental development where he could do abstract reasoning, could have worked all this out. The answer is that I don't know. Yet I know it happened. I remember arguing about it with other boys in the Boy Scouts a year or so later, trying to explain how the universe was supposed to have began, and how much of what we saw in the world around us worked by natural laws. I'm not that much of a prodigy. I suspect that I was able to do it because there weren't a lot of adults around telling me not to. That's the one other thing that my parents did that contributed to my being an atheist - they believed that everyone should make up his own mind about things. I just went ahead and did it. It certainly wasn't until later that I worked out a lot of the other reasons for being an atheist, like that it wasn't necessary for there to be gods for the universe to exist. Nor were they necessary to explain random chance, as I learned when I took probabilities in high school. It wasn't until even later that I finally realized that not only was it not necessary, but it actually made no sense that they should be required to make this complex thing we live in. After all, if that were true, then something would have been needed to have made them, too. And just what would that be? And it wasn't until the fifth Star Trek movie came out, in fact, that I finally really realized that I would never believe in such things. 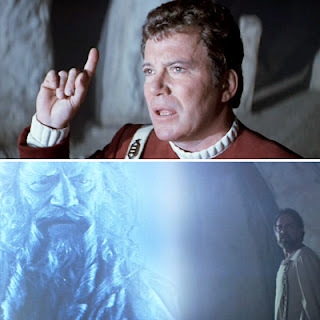 For those who may have managed to forget that movie, let me remind you that in it, there is a scene where Kirk and Spock are meeting some alien who is posing as God, the creator of the universe, etc. Kirk eventually works out that this isn't really God, because God wouldn't need a space ship, now would he? Sometimes even bad art can be thought-provoking, though, because it was in that moment that I finally realized that if I were ever actually in that situation, I'd be assuming that I was being confronted with some sort of trick or illusion, or at best by an entity that was a lot more technically advanced. I figured that people who are inclined to believe in that sort of thing would assume that this was their god or one of their gods, or maybe it reminded them more of someone else's, but I wouldn't have been a convert. I would have been trying to figure out what the trick was. That's when I finally knew that I'd never be anything but an atheist, and that religion was mostly boring nonsense that other people needed to talk about for some reason. So, that's why I'm an atheist - because my parents let me make up my own mind, and I did. Nothing more to it than that, really. Still, I managed to find a picture that fits in with the tale. Maybe that makes up for the lack of drama. "...in that moment that I finally realized that if I were ever actually in that situation, I'd be assuming that I was being confronted with some sort of trick or illusion, or at best by an entity that was a lot more technically advanced." Exactly. I once got mired in a discussion of "what evidence would convince you of a God"; my answer was pretty much "none" and I was accused of being a "fundamentalist". But it seemed more reasonable to assume my mind, or someone else's mind, was playing tricks on me, than that any single perception overrode everything else I knew about the Universe. The other piece of the puzzle is that I once was very religious and untying that knot was a very thorough process for me. Re-tying it would have to cross a lot of t's and dot a lot of i's, and skeptical thinking isn't exactly religion's home field. With fundamentalists, it seems to come down to them being hammers and everything else looking like a nail. The last time anyone asked me a question like what would it take for me to believe in their god(s), I said I'd have to lose much of my higher brain function, or somehow forget what people have learned in the last four centuries. That was quite some time ago. Nowadays, I don't think even the latter possibility would be enough. How Ignorant Do You Have To Be?